That 300mm f/4.5 Nikkor-H is a monster. The lens itself is 2.42 lb (1.1 kg) plus my D40 at 1.05 lb (475 kg) for a total of 3.47 lb. 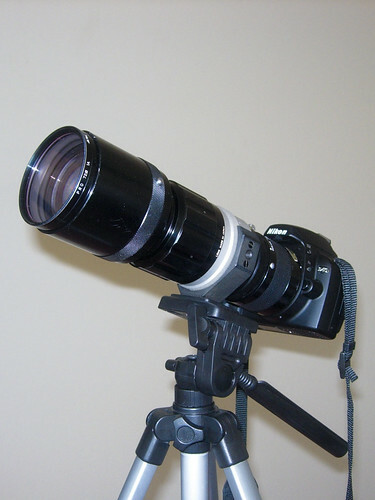 Add a TC-200 2X teleconverter on it, and we’re talking about a 4 lb camera lens combo. Handholding that combo is definitely not recommended. Even without the teleconverter, the lens is so heavy that the frame in the viewfinder is jumping up and down from the lack of stability. There goes any chance of composition. <$100 – including both legs & head (if needed). Of course, the cheaper the better. light weight – The camera’s heavy enough. I don’t need more weight. The general concensus seems to be that monopod legs isn’t that big a deal. As long as it’s strong enough to prop up your gear, that’s all you need. Unlike a tripod, the monopod’s job is not to give you rock solid stability–it’s to provide you more mobility by relieving you of the heavy weight. So given the above criteria, I’ve narrowed it down to these options. They’re all good legs–just need to pick the right one for myself. It’s very light in weight, and has a very compact folded length, but it’s only got the the minimum load capacity I was looking for. It’s definitely enough for my heaviest gear now, but not sure how much more gear I may buy in the future (They say NAS is a incurable). Still a great lightweight option, but for $10 more, I can get a huge increase in load capacity at the cost of some extra weight. This is the one I’m very seriously considering. It’s got excellent load capacity–more than enough for my lifetime, at least. All the other specs are right in between the 676B and 681B. In my opinion, it’s a very nice compromise between it’s bigger brother (681B) and younger brother (676B). This is the other leg I really like. It’s the big brother, and to me, seems like the only monopod you’ll ever need. It’s got the maximum load capacity that Manfrotto makes for monopods, and you don’t need to spend a fortune to get it (unlike the Gitzo’s). It isn’t very light, and it isn’t very compact, but I think I can live with that. And if $55 can buy me a monopod for life, that doesn’t seem so expensive. I toss this on the list because of 2 reasons: it’s dirt cheap, and it has a built-in ball head. However, it doesn’t meet my load capacity requirement– 4.4 lb is just barely meeting my current load, and it won’t be usable at all if I were to upgrade any equipment. The built-in ball head is nice to have, but sometimes a ball head may not be the best choice. I’d rather have separate legs and choose what head I want to put on it, if any. Third, it doesn’t come in black. Call my vain, but I like to keep my Nikon color scheme. Amazingly light weight, since it’s the only carbon fiber monopod on the list. Decent load capacity as well. Feisol is a Taiwanese company that offers support equipment with quality very similar to Gitzo. Reviews seems to be very favorable, and price is still much more affordable than Gitzo. But for me, it’s still a bit steep, especially with shipping being an additional $24 because it’s coming from Taiwan. Of course, you can’t beat a Gitzo. But you definitely have to pay for it. If you got $300 to burn, by all means, go for the GM3550 or 5540 and never look back. No one has ever regretted buying a Gitzo. Ever. Manfrotto also offers another excellent option. The 685B Neo Tec monopod has a very unique design that allows you to adjust the height almost instantaneously. At $145, it’s cheaper than the Gitzo, but a bit more expensive than the standard designs. Still a good option if it is within your price range. It’s just not within mine. A lot of monopods users directly mount their lens on the pod, with no head at all. Depending on your shooting needs, that can be perfectly fine. Simply moving the camera left and right allows you to pan. Moving up and down is a bit more awkward, and to a certain extent it can be done with the monopod directly attached. However, in situations where up & down camera movement is frequent, such as bird photography, a head attachment can be very beneficial. A simple, lightweight head that offers vertical mobility for a very inexpensive price. For $20, it doesn’t get any cheaper than that. Basically the same as the 3232 except for an important upgrade: the RC2 quick release system. This can be very convenient if you attach and detach the monopod leg from the camera pretty often. To me, the small price increase is worth the extra convenience. The next step up is actually a tripod ball head, but can be used on a monopod too. There are certain benefits for using a full ball head on a monopod, such as the ability to easily position the camera in any orientation. The other advantage is the possibility of reusing the same head on a tripod and monopod, thereby reducing the cost of having to buy 2 heads. However, the extra mobility of a ball head can work against you sometimes when a heavy lens is attached. Of course, you can use any model of ball heads out there, from budget models to very expensive tripod heads from Markin, Kirk, Really Right Stuff, etc. RRS also has a clamp & release system attachable to the 3232 to allow compatibility with the more common Arca Swiss type release plates. If you are already invested in that standard (L plates, Wimberley, etc. ), this option allows you to use a swivel-tilt head with the quick release plates you already have. In my opinion, the quick release clamp on the 3229 head is worth the premium over the standard screw on mount on the 3232. I’ve heard good things about Manfrotto’s RC2 quick release system, so I don’t feel that I’ll be locking myself exclusively into it by buying this head. My future tripod head purchase may very well be one of the Manfrotto RC2 models. As for the legs, the choice a little harder. The 679B definitely provides enough load capacity for me. As a result of a lower max load, it is also a little more compact and lighter than the 681B. On the other hand, the extra load capacity of the 681B gives me a warm fuzzy feeling that this leg is the be all, end all of legs for me. For $10 more, that extra security looks pretty attractive. Bottom line is, you can’t go wrong with either combo. They are all excellent options. I’ve owned the 679B (formerly the Bogen 3216) for almost 20 years — bought it from B&H before I came to work here back when I was shooting full-time. I never use a head since all the lenses I use with the monopod have rotating tripod collars. It’s held a full-size 35mm pro SLR with motor and lenses up to my 400mmm and my old 600/8 cat lens. Thats funny, I just got my FEISOL monopod and wasn’t happy about the shipping fee for this lightweight monopod too. So I send an email to these guys from feisol.net and got the shipping for $8. They are working on their shop system and will change the shipping fees these days anyway.. thats what they said. I’m very pleased with this pod.. looks and feels very pro!